New South Wales Imperial Bushmen War Diary, 15 August 1900. This is an extract from the War Diary written by Major David Miller, Adjutant of the New South Wales Imperial Bushmen who arrived in the Mozambique port of Biera and then moved to Rhodesia as part of the journey for deployment in South Africa to see action in the Boer War. Column started at 7 a.m. arrived Otto's Hoop at 4 p.m. - 10 miles. Slight engagement with enemy outside Otto's Hoop - enemy retired. We occupied village and commanding positions. Movable Magazine from which supply columns replenish consists of seven (7) steam road trains with carrying capacity of say 250 tons. Supply Park (Brigade) consists of nineteen wagons. The column left Mafeking and re-occupied Ottoshoop. 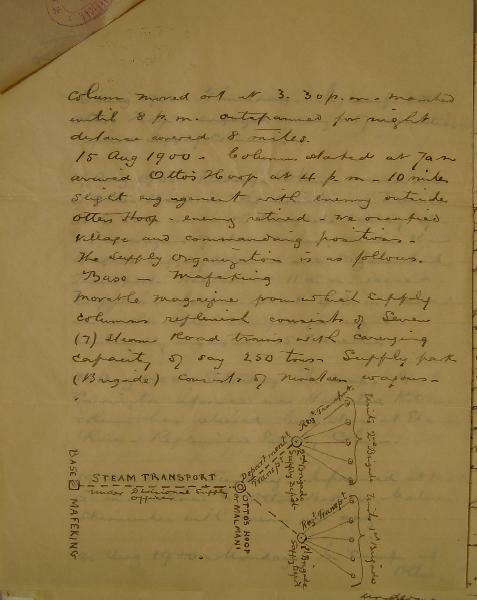 Miller outlines the supply lines he established for the column.